• Life In the Digital Age, Part I: Google Search "Winners"
It is clear that Donald Trump feels the need to do something to demonstrate to his base that he's "strong" on the Mexican border. We've suggested several likely motivations for the sudden push: (1) Carping from Fox News pundits, (2) Trying to capitalize on the "momentum" he got from the Barr summary of the Mueller report, and (3) The looming failure of his NAFTA replacement. It is also very possible, at this point, that Trump has some sort of insider information (Polls? Feedback from Sean Hannity? Something else?) that tells him that building a few miles of border fencing, with money essentially stolen from the Dept. of Defense, is not going to get it done with the base. All of this laid the foundation, then, for Trump's renewed threat to shut down the border entirely. There is little question that such a move would have serious economic consequences, and would likely generate lots of bad PR for the administration. On Tuesday, it was reported that White House staffers are looking carefully at ways to minimize those economic consequences. What that means is that Trump is still inclined to shut down the border, and his staff is working to minimize the damage as much as they can if they cannot talk him out of it. The eventual winner of this battle of wills is anyone's guess. Sometimes the staff wins (e.g., the military parade), and sometimes Trump wins (e.g., the government shutdown). Congress has to meet quickly and make a deal. I could do it in 45 minutes. We need to get rid of chain migration. We need to get rid of catch and release and visa lottery. And we have to do something about asylum. And to be honest with you, we have to get rid of judges. It is the worst, dumbest immigration system in the world. The Democrats can change it in one meeting. Everyone would agree. But they don't want to change it because they don't want to give Republicans a victory. Speaking of things being done to gin up the base, there is also the Trump administration's newfound attempt to eliminate Obamacare. Actually, as with the border shutdown, it is not a Trump administration initiative, it's a Trump initiative. His advisors, including AG Bill Barr and HHS Secretary Alex Azar, don't support the President's decision. If a president's main legal advisor and main healthcare advisor tell him that a healthcare-related lawsuit is a bad idea, that is pretty instructive. But it wasn't for Trump. Still, Trump did (sort of) change his position late Monday night. While he hasn't ordered the Dept. of Justice to back off its support for Judge Reed O'Connor's ruling that struck down the entire ACA, he did signal (via Twitter) that his focus going forward is going to be a brand-new healthcare plan that he promises to reveal just as soon as the 2020 election is over. On Tuesday, we learned about the behind-the-scenes maneuvering that led to Trump's (semi-) change of heart. A number of high-profile Republicans, including Senate Majority Leader Mitch McConnell (R-KY), bent his ear throughout this weekend, trying to convince him of the error of his ways. This is not to say that McConnell & Co. are concerned about the harm that would be done to millions of citizens, because they are not. Their only concern is the political fallout from another election where Obamacare is front and center. Consequently, Trump was persuaded to accept three basic propositions: (1) Not to put anti-Obamacare front and center, because that's a loser; (2) To promise something better after the 2020 elections; and (3) If he must attack Democrats on healthcare, to focus on Medicare-for-all. The President's response on Tuesday night certainly suggests that the message sunk in, at least for now. Whether Trump can stay on message is anyone's guess. And whether running against Medicare-for-all will be a winner is also anyone's guess. The trick, at least on the latter point, is how the matter is presented. As a general concept, a solid majority of Americans favor the idea (56% to 42%). However, once we get into the weeds (i.e., paying for it), then support starts to fade dramatically (as low as 26%). The good news for the Republicans is that it's easy to raise these (valid) questions. The good news for the Democrats is that they know what's coming, and can hone their answers throughout 2019, before most voters are paying close attention. Politico has an interesting piece right now about the size of the Democratic field. It was written by Lilly Kofler, an expert in behavioral science, and her basic argument is that there are just too many Democrats running for the good of the Party. The first issue is that it's too difficult for voters to keep track of 20-25 people, and to make informed decisions about which of them is the best candidate. The second is that many Democratic voters may find a candidate they regard as ideal or near-ideal, and then could lose enthusiasm when the Party settles on a considerably less ideal choice. Of these two problems, the one that is far and away more worrisome for the blue team is definitely the second one. It's true that most people are not committed enough to their political junkiedom to keep track of two dozen aspiring presidents, but it's also the case that cream tends to rise to the top, and that nobody really knows what a good president looks like until they actually do the job. The second problem, on the other hand, is known as the paradox of choice (though Kofler doesn't use that exact phrase), and was on full display in 2016. How many Democrats (and Independents, and Greens, and so forth) were unwilling to vote for Hillary Clinton, at least in part, because they saw her as an inferior alternative to Sen. Bernie Sanders (I-VT)? In 2020, some Democratic voters could find their enthusiasm for the party's standard bearer wanting because, say, Sen. Kamala Harris (D-CA) isn't Sanders, and others because she isn't Pete Buttigieg, and still others because she isn't Beto O'Rourke, and still others because she isn't Sen. Elizabeth Warren (D-MA). Kofler has some advice for candidates who are trying to deal with this problem. For example, she likes the idea of an early president-VP pairing, like Biden-Stacey Abrams, which would help the former VP to stand out from the crowd (assuming he runs, see below). On the other hand, waiting until it is over and then picking the person who came in second or third would at least prevent that person's supporters from going off and sulking. For example, if Biden wins and Harris comes in second, a Biden-Harris ticket could soothe some hard feelings as her supporters start printing "HARRIS 2024" bumper stickers. Kofler also supports the adoption of a signature look, clothing-wise, which gives voters a memorable visual cue that helps them to remember a candidate. She cites, as an example, Buttigieg's fairly standard uniform of tie and white dress shirt, without jacket. The author also suggests that the Democratic Party find ways to give the individual candidates a more useful platform to present themselves to the voting public (i.e., town halls, as opposed to debates). She doesn't say it directly, but she does imply that the DNC needs to winnow down the field as promptly as they can. Giving every viable or near-viable candidate a seat at the debate table is good and well, but there is probably much wisdom in quickly tightening up the standards needed to qualify. Put another way, if a candidate does not gain serious traction after six months of campaigning and two debates (late June, and then late July), then they probably aren't going to. Joe Biden isn't a formal candidate for the presidency yet, and he's already in some trouble, maybe even quite a bit of trouble. On Tuesday, two more women came forward to accuse him of touching them inappropriately. For any male candidate in the MeToo era, this would be difficult to overcome (and that's assuming that more accusers don't come forward). For a male candidate who earned some infamy due to his handling of Anita Hill, it may be insurmountable. If Biden does decide against a run, it could give some oxygen for other candidates in the Democratic field to breathe, and may even allow things to shake out a bit. Or, maybe not, because on Tuesday, former New York mayor Michael Bloomberg said that if Biden drops out, that will leave the centrist lane open, and that he (Bloomberg) may well enter the race. In other words, the billionaire's full Sherman was apparently contingent on Biden's declaring. Life In the Digital Age, Part I: Google Search "Winners"
There are a number of reasons that the prognosticators of 1948, including the ones who worked for the Daily Tribune, made this mistake. Foremost among them, however, was that political polling was in its infancy, and—in particular—the pollsters didn't know enough to correct for the likely makeup for the electorate. 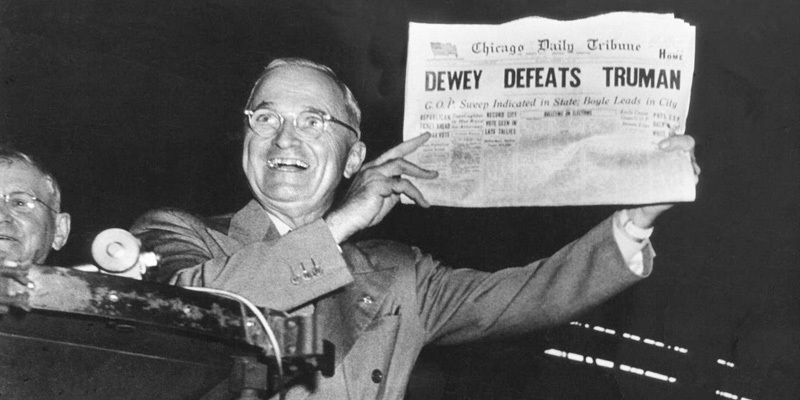 The staff at the Tribune was expecting Dewey to win (in large part due to the faulty polls), so when a few early results dribbled in showing Dewey ahead, they went to press with the headline. They also had trouble accounting for the fractures within the Democratic party (i.e., the candidacy of Dixiecrat Strom Thurmond). There are, of course, some problems inherent with this data. First, Internet users are, on average, wealthier, younger, more educated, and whiter than the average voter. 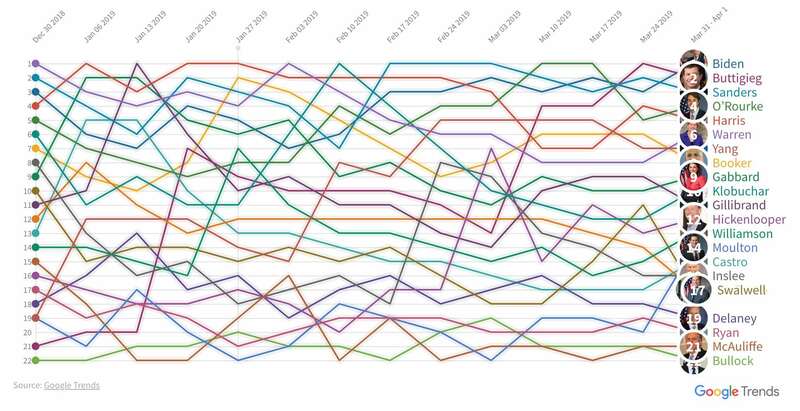 Second, candidates like Buttigieg and Yang have a bit of an advantage, since someone who is basically unknown and then gets some attention is more likely to trigger searches than someone who is well known and then gets some attention. After all, is there really all that much that voters don't know about Bernie Sanders or Joe Biden? Following the 2016 election, Facebook got a lot of the wrong kind of attention, as it became clear that the platform was used to spread a great deal of propaganda, and also that it contributed substantially to the increasing polarization of the American electorate. CEO Mark Zuckerberg promised that changes were coming, and specifically declared that future visits to Facebook would be "time well spent." Three things are immediately apparent from looking at the chart. The first is that there is no basis for claims that conservative outlets are censored, as three right-wing outlets are in the top 15, including #1 Fox News. The second is that contrary to Facebook's promises, there is still plenty of room for "news" that stretches the truth to the breaking point, as happens with #12 Breitbart, among others. And finally, it is clearly still possible to job the system, as #11 Lad Bible is a site that specifically exists to promote sharing of its dubious-quality pages. 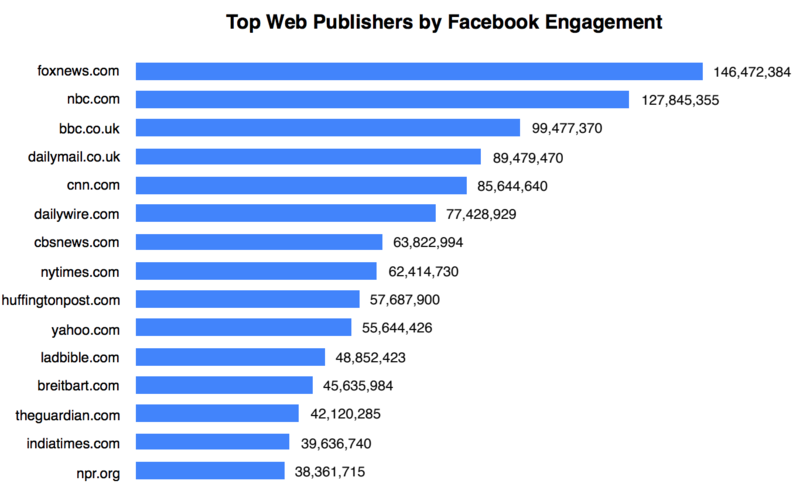 The study's broader conclusions are not good news for Facebook, or for anyone else. 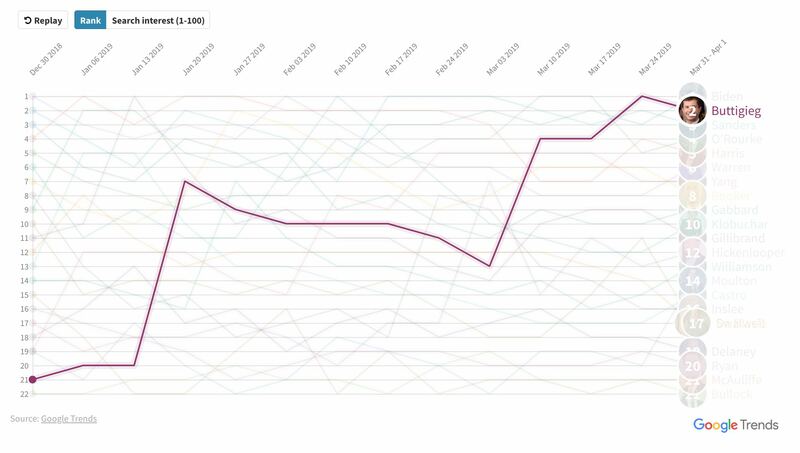 People are spending more time on the platform, their bubbles are getting thicker, and their anger is getting more profound. The most-shared stories are, almost without fail, negative and political. Among them: "New York Set to Legalize Abortion Up to Birth," "Democrats Pass Bill to Fund College for Illegal Immigrants with Taxpayer Money," "Trump Backs Push for Bible Classes in Schools," and "Dems to Strike 'So Help Me God' from Oath Taken in Front of Key House Committee, Draft Shows." Among the "reactions" that Facebook allows users to register to an item are an "angry face," and the outlet that triggers the "angry face" far and away more often than any other is...Fox News. Hacking elections? That's so 2016. According to the folks whose job it is to anticipate such things, the hot target for ne'er-do-wells in 2020 (and beyond) will be the upcoming census, which will be the first census to be conducted primarily online. The U.S. Census Bureau is partnering with other executive departments, along with private entities like Facebook, Google, and Microsoft, to make things as secure as they can. There are plans to encrypt information, to use algorithms in order to identify suspicious patterns or responses, and to scan social media platforms for evidence of conspiracies. The Bureau has also purchased over 100 different domain names, so that evil-doers can't set up fake census data collection sites. That said, the task before them is enormous. It is going to be extremely tricky to collect all of the information needed from U.S. residents. They may be leery of participating in an online census, given the general reluctance to share information online, as well as the specific politicization of this census by the Trump administration. It will be necessary to make it fairly easy for U.S. residents to respond, and also to offer them multiple opportunities to do so. However, the wider and more frequently you open the door for legitimate respondents, the more opportunities you give for a non-legitimate respondent to sneak in. So, the Census Bureau will have to find the sweet spot between the two competing imperatives, which will not be easy to do. When the day began on Tuesday, we knew (as we have for several weeks) that the people of Chicago would elect their first-ever black, female mayor. That is because both candidates met that description. When the votes were counted, it turned out that the new mayor-elect is Lori Lightfoot, who is not only black and female, but is also a lesbian. Chicago, the third-largest city in the nation, promptly leaps to the top of the list of largest cities to have an LGBTQ mayor (admittedly, it's a pretty small leap, as the city that was at the top of the list was number 4 Houston). Much attention is being paid to Lightfoot's race, of course, but perhaps more should be paid to her gender, as black mayors of large cities have actually been more common than female mayors. In fact, of America's five largest cities, all have had black mayors, but only two (Chicago, with Jane Byrne, and Houston, with Annise Parker and Kathy Whitmire) have had female mayors prior to Tuesday. And, in case you were wondering, the largest cities prior to Chicago to elect a black, female mayor were (in order of size, from largest to smallest): San Francisco, Charlotte, Washington, Baltimore, and Atlanta.